Tucked into a strip mall on 29N, this no-frills, order-at-the-counter joint specializes in whole chickens cooked over coals in a rotisserie imported from Peru. While the chickens are delicious, the Mexican dishes may be even better, which is no wonder given the heritage of owners Myriam and Claudio Hernandez. Claudio is from Puebla and Myriam from Morelos, and the menu showcases the street food of their home regions. One Puebla specialty is a “cemita,” and Al Carbon makes a stellar one – sesame seed bread piled high with avocado, the meat of your choice, adobo chipotle peppers, fresh Oaxacan cheese, papalo red onions, and a slice of ham. In addition to great options for solo diners, the menu includes family meals like whole chickens with a selection of sides. Opened in 2014, Al Carbon quickly became one of our go-to takeout joints in town. There are also plenty of tables for dining in, and bottled beers to wash down the fiery food. With a quality-to-value ratio that is difficult to match, Al Carbon is on a very short list of restaurants we would most wish to live near. 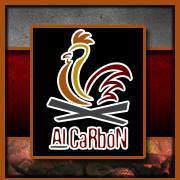 From the chicken to the sandwiches to the sides, it’s hard to go wrong at Al Carbon. Below is a list of our suggestions, the Hernandez’s own favorites, and appearances in Five Finds on Friday, where a local chef or personality has named an Al Carbon dish as one of the best in town.